Enjoy historic Dandridge from the hotel's property set. 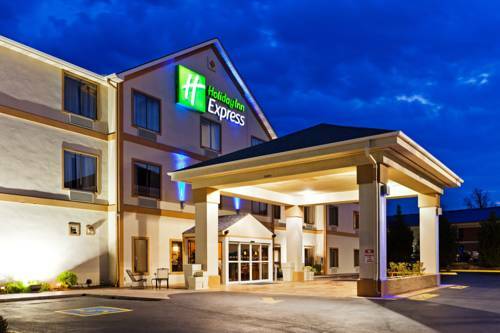 In the foothills of the Great Smoky Mountains is the warm and welcoming Holiday Inn Express Hotel Dandridge. From the hotel's roaring fireplace to a sweeping staircase, guests enjoy unique and distinctive details that set these accommodations apart from the rest. Since we're off I-40, business patrons find it easy to make it to meetings on time in Dandridge, TN. In addition, the hotel has complimentary high-speed, wireless Internet access throughout the facility, and a Business Center with a personal computer and a printer. Families can take advantage of the hotel's location near Dollywood, while outdoor lovers can explore the trails of Great Smoky Mountains National Park and Douglas Lake. NASCAR fans are an hour from the races In Bristol. Parents visiting students at Carson Newman University are only 15 minutes away. And don't forget that great shopping awaits at the Tanger Outlet Center in Sevierville. Offering rates for every family's budget, we're the pet-friendly place to stay in Dandridge, TN. Hotel amenities include an outdoor pool and whirlpool, so you can soak your feet after a day of fun. Just make sure you wake up in time to enjoy the free, hot Express Start Breakfast Bar before heading out for another great day. We look forward to seeing you soon. Opened May 1, 1982, as part of the Knoxville World's Fair. Abandoned in 1999, restored and reopened in 2007. Its tower was originally painted blue so that the gold ball on top would appear more sunlike. Relic from the Civil War, when every building was evidently in the line of fire. Plaque on church says it was built on land owned by VP Andrew Johnson, which is maybe another reason why someone took a potshot at it.